In 1900, Greek sponge divers stumbled across "a pile of dead, naked women" on the seabed near the tiny island of Antikythera. It turned out the figures were not corpses but bronze and marble statues, part of a cargo of stolen Greek treasure that was lost when the Roman ship carrying them sank two thousand years ago on the island's treacherous rocks. It was the first marine wreck to be studied by archaeologists, and yielded the greatest haul of ancient treasure that had ever been found. Yet the salvage project – carried out in treacherous conditions with desperately crude equipment – was never completed. So this month, armed with the latest diving technology, scientists are going back. Between 1900 and 1901, the sponge divers retrieved a string of stunning antiquities, including weapons, jewellery, furniture and some exquisite statues. But their most famous find was a battered lump that sat unnoticed for months in the courtyard of Athens' National Archaeological Museum, before it cracked open to reveal a bundle of cogwheels, dials and inscriptions. It has taken scientists over a hundred years to decode the inner workings of those corroded fragments, with x-ray and CT scans finally revealing a sophisticated clockwork machine used to calculate the workings of the heavens. Dubbed the Antikythera mechanism, it had pointers that displayed the positions of the sun, moon and planets in the sky, as well as a star calendar, eclipse prediction dial and a timetable of athletics events including the Olympics. It's a stunning piece of technology that revolutionises our understanding of the abilities of the ancient Greeks. Nothing close to its complexity is known to have been created for well over a thousand years afterwards, and the emergence of mechanical clocks in medieval Europe. There are questions that remain unanswered, such as where it's from and who built it (Posidonius, a philosopher who lived on Rhodes during the first century BC, is one candidate, while the third century BC genius Archimedes may have invented this type of device). But one of the most intriguing mysteries relates to the wreck on which it was found. What's still down there? The undersea explorer Jacques Cousteau spent a couple of days at the wreck site in 1978 and brought up some precious smaller items, including some coins from the Asia Minor coast, which suggested that the ship sailed from there around 70-60 BC (probably carrying war booty from Greek colonies back to Rome). But even with their sleek scuba gear, Cousteau's divers could spend only brief minutes on the seabed without risking the bends. No one has been back since. Now, after years of negotiations with the Greek authorities, Brendan Foley, a marine archaeologist based at Woods Hole Oceanographic Institution in Massachusetts, finally has permission to dive at Antikythera. He's working with Greek archaeologists including Theotokis Theodoulou of the Ephorate of Underwater Antiquities. Any items found on the wreck site could provide further clues to the origin or ownership of the ship. 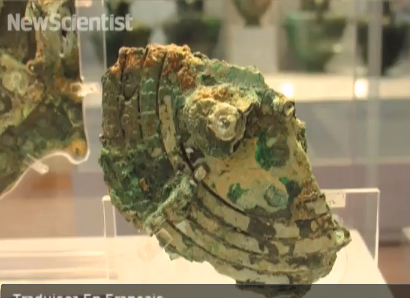 And not all of the pieces of the Antikythera mechanism were ever found. It's a long shot, but those missing bits could still be on the seabed. This isn't what gets Foley most excited about the project, however. His team will also dive around the entire island, a distance of about 17 nautical miles, using James Bond-style propellers to cover ground quickly. Foley hopes this could reveal a whole clutch of previously unknown wrecks. The island of Antikythera sits in the middle of what has been a busy trade route since ancient times: a treacherous shard of rock notorious for downing ships in a storm. In Roman times, it was also an infamous centre for pirates. So it's a good bet that there are plenty of other wrecks here, from all periods of history. On a two-day reconnaissance survey in June this year, Foley and his team discovered the wreck of a British warship called HMS Nautilus, lost in 1807, plus a range of ancient anchors, ceramics and a 19th-century naval gun. This suggests the area hasn't been looted (which makes sense given the difficulty of diving here), so any new wrecks found could be pristine. "Everyone is very, very excited," Foley says of the upcoming mission. "This ought to be extraordinary." He also points out that the Antikythera ship, with its valuable cargo, is unlikely to have been travelling alone. When it sank, others in its fleet may have gone down too. Could one of them have been carrying another Antikythera mechanism? For the past hundred years, this awe-inspiring device has stood alone, our only glimpse into a technology lost for millennia. That might – just might – now change.